When Parker steals the billfold of a platinum-haired woman named Zelda in a fancy hotel, he’s just looking to score some cash. But what he ends up with is a life-changing encounter with a woman who claims to be immortal. Parker, of course, doubts her story, but there is no denying her influence over people and her ability to charm just about everyone she meets, not least of which is Parker himself. Mute and angry at the world since the death of his father, Parker could use some saving. But Zelda has issues of her own and it is Parker who thinks he can be her saviour. What results is a surprise to everyone. 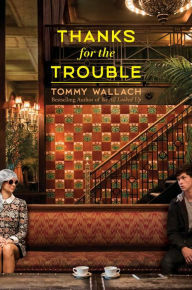 Witty and wise, Wallach creates an original tale that mixes coming of age with a little Highlander style mystery (sans the swords and the Sean Connery). A healthy does of fairy tale fantasy is thrown in through the inclusion of Parker’s writings. While largely peripheral to the story, these fairy tales are good enough to not detract and mostly provide nice interludes. I got a little bored with the restlessness and constant traveling around town (San Francisco in this case), but the story kept me hooked and enchanted until the end. Recommended.